Hendrick Frans Verbruggen (Henricus-Franciscus Verbrugghen), Flemish sculptor, architect and book illustrator, son of Peeter Verbrugghen (1615-1686). 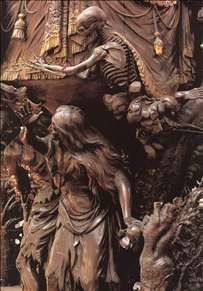 He began his career under the book illuminator Jan Ruyselinck but became a master sculptor in 1682, the year he married Susanna Verhulst. He became Dean of the Guild of St Luke in 1689. Most of his work was done for churches. In 1684 he created two limewood side altars (h. 5 m) for the chapel of Our Lady of Good Will at Duffel. 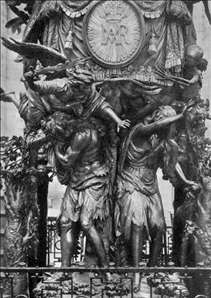 Here he introduced into the Netherlands a new motif, derived from the work of Bernini and consisting of an oval painting supported by two flying angels. His communion rails (1,20 m; 1695) for St Walburgis, Bruges, are a highpoint of Flemish Baroque sculpture; the virtuoso handling of the marble makes them look as if modelled from wax. 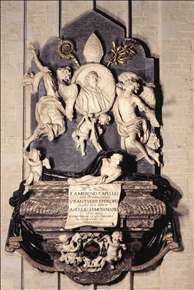 His tactile sense is best shown in the figure of St Augustine (h. 7 m; 1697), placed under the pulpit of St Augustine s, Antwerp, in which the grain of the wood is used to suggest the wrinkles of the saint s face and the texture of his clothes. 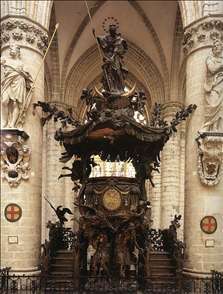 In the highly original oak pulpit he made for the Jesuits of Leuven (1696-69; Brussels Cathedral), a narrative scene is included under the body of the pulpit, which is united in a curvilinear movement with the supporting beams and the sound-board. 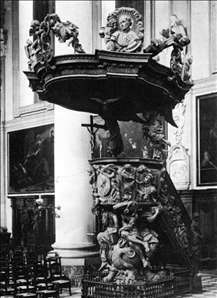 In 1713 Henricus-Franciscus went bankrupt, but he continued his work on the marble high altar (1713-19) of St Bavo, Ghent. See more details about "Memorial of Bishop Marius Ambrose Capello"
See more details about "Adam and Eve Banished from Paradise (detail of the pulpit)"